Stackable Totes are freestanding totes for indoor or outdoor stationary or transportable applications (non DOT approved). The 35, 70 & 120 Gallon Totes feature four lift ears for lifting each tote and a 4-way forklift accessible skid is available for handling those same totes. 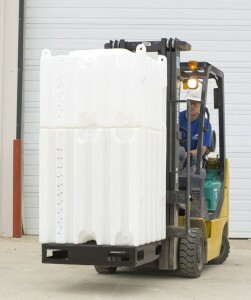 180 & 240 Gallon tote sizes are available with a 4-way forklift accessible tote adaptor to assist in handling the totes. 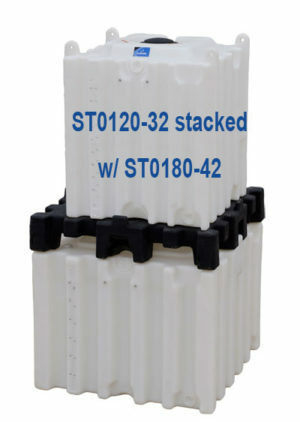 This adaptor also serves as a way to adapt the smaller sized totes to the larger. All totes are manufactured from high-density polyethylene with U.V. stabilizers. Standard weight totes are designed for chemicals with a specific gravity of 1.5 or less. 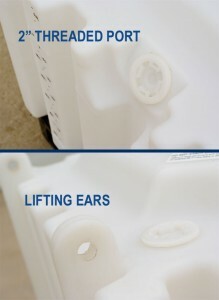 Gallon indicators are included on one side of the totes for calibration.